I first began collecting and organizing my old print articles early last summer, believing that having them all conveniently available in book form would be useful for my planned Harvard Overseer campaign. 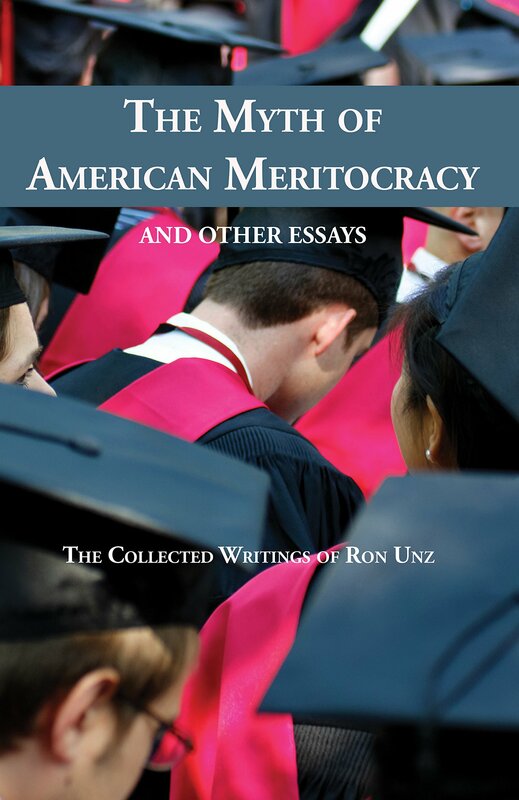 Now at very long last the regular hardcover edition of The Myth of American Meritocracy and Other Essays has been delivered from the printers and is available for easy distribution and open sale at Amazon.com, with a Kindle edition to soon follow. Unsurprisingly, the entire process took far more time and effort than I ever expected, and given the relative paucity of nonfiction collections by mainstream presses, required quite a bit of thought to issues of organization and design, as well as the aesthetics of layout and typeface. The magnitude of this initial effort meanwhile persuaded me to incorporate more and more of my material into the text, since I would hardly be likely to publish any second collection in the future. As a result, the volume ultimately came to include virtually all my print articles of the last thirty years and a few of my more recent web columns, thus pushing the length past 700 pages, including a lengthy and comprehensive index. When I cautiously opened my first shipped box this afternoon, I was quite pleased with the physical quality of what I held in my hand, and the first book published by the newly established imprint Unz Review Press seems of fully professional quality. Given the absence of costly overhead and my lack of mercenary motives, I have priced the thick, attractive hardcover edition at an inexpensive $19.99. Free Amazon shipping is a nice option, though it may be another week or so until the Amazon.com’s own sales page is ready, displaying the book just like any produced by Harcourt or the Free Press, and also allowing international shipments and sales. Any journalist, writer, or academic wishing a complimentary copy for their personal use need only contact me to receive one. When considering a collection of previously published articles, unexpected patterns may appear. Such was the case as I reviewed the contents of this book, containing works originally written over a span of thirty years. The earliest of my pieces are academic papers on the history of Classical Greece, attempting to reconstruct the true events of that era from sources that are often fragmentary, unreliable, and contradictory. Scholars in that field must seek to extract a measure of factual reality from a mountain of propaganda and distortion, knowing full well that embarrassing details are often completely omitted from the narratives of our informants. While doing such research during the early 1980s I often told my friends how different ancient historical analysis was from that of modern times since “everyone knows” the basic facts about the wars and other major events of the twentieth century. I was naive. There is a fitting symmetry that one of my earliest papers provided a careful analysis of the source material indicating that Alexander the Great had younger brothers whom he murdered when he came to the throne, while one of my most recent articles applied the same sort of critical analysis to present-day evidence, suggesting that the Vietnam military record of supposed war-hero Sen. John McCain may have actually been rather similar to that of the notorious “Tokyo Rose” of World War II fame. Over the last dozen years I have discovered that we live within the distorted matrix of “American Pravda,” and that determining the true events of our world requires much more effort than merely scanning the morning headlines of the New York Times and the Wall Street Journal. These writings also trace the evolution of my views in topics of race, ethnicity, and social policy, long my primary area of focus and the one that accounts for more than half the pages of this volume. In late 1999 I published a 9,000 word cover story on California’s racial transformation in Commentary, flagship organ of the neoconservative movement. That exposition took a strongly positive view of the immigration trends in our society, a stance I had also taken in numerous previous pieces. 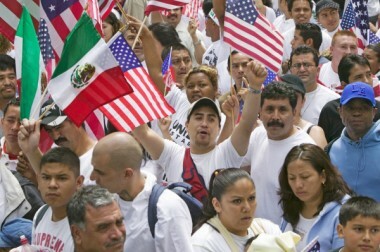 But a dozen years later America’s economic landscape had greatly changed, and when I published my 12,000 word sequel describing the racial transformation of our entire nation, it ran in The American Conservative—a leading anti-neoconservative outlet—where I argued that immigration levels were now far too high, also outlining a viable political strategy to curtail them. That latter suggestion proposed a very large hike in the minimum wage, and this topic soon became the focus of much of my subsequent writing and political activity, which had previously had little connection to economic issues. I would like to think that my work has played a significant role in helping to move that important idea back to the center stage of American political life. And then there is “The Myth of American Meritocracy,” the title piece of this collection, running well over 30,000 words with its many footnotes and appendices. Although our elite educational institutions have almost entirely ignored the massive, quantitative documentation that racial discrimination and endemic corruption lie at the heart of our allegedly meritocratic society, many of their victims have come to recognize the injustice of their situation, and I strongly doubt that our current system will long survive unchanged. In an age when the Internet has so rapidly displaced traditional printed matter, does a bound collection of my writings make any sense, especially since nearly all of these are already available online? I think so, and if you are holding this book in your hands, you might agree. Different types of media are suitable for different forms of writing. The sort of short opinion pieces that once graced the op-ed pages of our vanishing newspapers are conveniently browsed on the web, just like the numerous informal blog posts that have largely replaced them. With attention spans dropping, much political debate is circumscribed by the 140 characters of a Tweet, but it is difficult to imagine such transitory sloganeering having much value in printed form. Meanwhile, popular fiction of any length is easily digested on a tablet or kindle, since a story is often read in short snatches of time, with the reader moving forward and rarely looking back. But my own writings tend toward serious non-fiction of considerable length, with over half this book consisting of major articles running 4,000 words or more, many of them much longer than that. I find that material of such heft is best read in printed form, and a stack of twenty or thirty 8.5”x11” sheets obtained from a website is far less convenient for such purposes than the pages of a professionally typeset book. Examine the table of contents, explore the pages herein, and judge for yourself whether this product is worth the paper on which it was printed. New York Times: Asian-American Quotas in the Ivy League? Meritocracy: Picking Our Elites at Random? Meritocracy: "Asians as the New Jews, Jews as the New WASPs"
Asian Quotas in the Ivy League? "We See Nothing! Nothing!" Meritocracy: Will Harvard Become Free and Fair? 28 Comments to "The Myth of American Meritocracy and Other Essays"
I do not have Kindle, but Kindle variant is for $ 2.99 .
the more so that they evolved in the 30 years covered by the book in question. Who am I even to discuss a claim of such kind ? But this book has a deep food for thought. Thank you, Mr. Unz, for your work. Great idea, and I wholeheartedly agree with your reasoning for publishing an old-fashioned book. Now, if you can just convince Sailer to do the same. Fat, dumb, distracted. This is not the condition of a polity you’d trust to pick good rulers. Robert Prechter, Jr., has published extensive studies that apply R. N. Elliott’s Wave Principle broadly. This work posits that a natural ebb and flow of growth and retrenchment describes most (if not all) life processes, including human social behavior. If his thesis is correct, the English-speaking world is completing a period of rapid and powerful growth that began in 1784 (the end of a bear market in stocks & social mood, revealed on the London Stock Exchange). This is a period that, despite wars of increasing destructive magnitude, was overall relatively peaceful and where violent death was limited to a shrinking sub-population. Nothing sets up failure like success. Success leads to complacency, complacency to corruption, and corruption to reversal. Systems for choosing rulers in the English West are clearly toxic, with the last 50 years of “rally” coming on the top line even as systematic monetary debasement and the phony wealth of debt ownership metastasized to levels that astonish. We are ruled by criminals who behave like thieves who set fire to a major manufacturing plant of fundamental importance to hide their crime of looting the change from the employee break room vending machines. To steal a few hundred million or even a billion here or there, they are (with full consent of the electorate, who scoop up the coins that fall on the floor) destroying the multi-trillion dollar engine that still provides endless luxuries and status symbols to the proles. In that order. Very smart people excel at rationalizing their biases (including self-interest) so it’s no surprise our rulers can bury critics in an avalanche of sophistry. They believe their own PR, of that there seems little doubt. The road ahead is rough. A long period of retrenchment is now required, necessary to wash away much of the irrational house of cards erected using a vast supply of such rationalizations. After all, it takes an extremely bright person to believe most of the theoretical absurdities that underlay modern finance and political economy. No polity the size of the USA can be effectively ruled. Too much anonymity and too much distance separate Lenin’s who from the whom. Too much Diversity [tm] leads to too few shared values among the resulting factions back-stabbing each other over looting the Treasury or establishing unequal status before the law. Collectivism in the form of factions based on race, class, etc., now rules completely. The next 100 years seem unlikely to be as peaceful and orderly as the last, and that’s said with a full appreciation of the 20th century corpse-casualties of ideological warfare of socialist polities (international, national and Fabian/Progressivist) and the wars over geography among nation-states. Just bought one at amazon too. Printed paper books still have their value. Some experts concerned that electronic media might left a digital dark age for the future since the virtual information might vanished away from the record. Most current archeological discoveries are based on the survival of physical artifacts (like dead sea scrolls, writing on potteries ect). Electronic virtual information is more like those oral stories without physical form. Oral story is in great danger of extinction. It was your willingness to follow the stream of data wherever it may lead, paddling the boat only with self-suggesting intuitions (common sense), that brought me here in the first place. This site and the opportunity for us to be a bunch of heretical jerks in the comment section is a credit to Unz and the monument of free speech! Dear Ron, thank you for your enormous contribution to the society of the thinking. I am an unaffiliated researcher who published peer-reviewed articles in 2008 and 2011 in professional journals with 2 more in process. I also have the honor of being 1 of the 201 holders of a Harvard degree whose signed petitions you recently delivered to the proper office in Cambridge. So perhaps you might consider sending me a complementary copy of your new book. You should have my mailing address from the petition project. It occurs to me that your point 1. about personal gain and its rationalisation for stealing is far too superficial and saying nothing to clearly point the finger of accusation at our times, though your later points about the size and diversity of the US are in point because they do indeed help to explain lack of restraint in pursuit of self interest. The “everyone is stealing so I may as well get in for my cut” has always had its analogues if not exact precedents. No doubt there were times when most people had no idea how much better off the rich in some parts of the world were than themselves but, at least in the world flooded with TV, the general sense of entitlement has added to at least 200 per cent. That in one sense merely emphasises the point that everyone feeling they are justified in stealing a bit doesn’t mean that they are going to act without restraint and moderation. And it leaves out the fact that there is such huge waste in everything large organisations do, especially governments, and especially in warfare, that a bit of thieving isn’t necessarily a big deal. Unfortunately, although I’d originally planned to make copies of the Harvard Overseer petitions for my records, things were too hectic at the end for this to be possible, so I don’t have any of the mailing addresses. But just send your name and mailing address to Ron(AT)Unz.com. Congratulations on publication of your book, and congratulations, also, on the sensible pricing of the digital version. So often e-books are offered at a price so close to that of a hard copy that one wonders what point there is in having an e-book at all. Quite likely, many who buy the e-book will upgrade to the print edition once they’ve seen what the book contains. For me, the essay on The Myth of American Meritocracy, would alone make the book a worthwhile purchase. But as for a higher minimum wage to deter immigration, the logic escapes me. Rather, the necessity of paying a high minimum wage is surely an incentive to hire at less than the minimum wage illegal and hence undocumented immigrants who pay no tax, with negative consequences for both the employment of American citizens and the quality of public services. A better solution to low or non-existent incomes, as well as an effective limit on the employment of illegal immigrants is to repeal minimum wage laws and supplement the incomes of the lowest paid workers either by means of a negative tax scheme, or by the auction of employment subsidies as I have outline here and, here. In either case, i.e., minimum wage or wage supplement, the public pays, either through higher prices in the former case, or higher taxes in the latter case. But wage supplementation has four advantages over a high minimum wage. First it would eliminate virtually all unemployment among the able-bodied since it lowers the price of a pair of hands to whatever is the market value of that pair of hands. Second, it eliminates the social costs of widespread unemployment, underemployment, and workforce abandonment, which include both crime and mental illness. Third, it would increase the GDP by the unsubsidized value of the labor employed plus the employers’ profits. Fourth, it would make the labor of most illegal immigrants uncompetitive with that of wage-supplemented American citizens. Does it include your chronology of the Pentecontaetia? Just want to say many thanks Ron for creating this website and your contributions to sociology/anthropology. You’ve changed my views completely on race, education and other thorny social topics. I hope this book will be available from the UK store, otherwise I’ll pay extra to ship from America. The contents section looks formidable. Didn’t know you wrote about economics or classics either. Thank you for the book and for the price point! $20 is extremely reasonable. I just placed my order. Combining it with “Humans Need Not Apply: A Guide to Wealth and Work in the Age of Artificial Intelligence” results in an order just over $35, and gives me some brain food for the next few months. Things are as you say, but you reveal quite a bit of optimism here. People are happy to live in ashes; the defectors out-duel the cooperators. I’ve always thought that time capsules should be more widely employed. 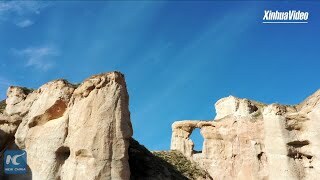 But to imagine a future with someone to dig them up and care evinces more optimism than I can spool up at the moment. Some argue that the convenience of an e-book makes them more valuable than a bound volume. The problem with your wage auction idea is that much of the unemployed are of negative marginal utility or of such low utility compared to the machine that replaced them that no one wants to hire them at any wage, and any wage subsidy amounts to paying them to stay home. We’re socially engineering generations of mentally neutered, entitled, self-centered adult children who can only get angry at inconsequential bull instead of critically thinking about what’s really wrong with the world happening all around them. When I cautiously opened my first shipped box this afternoon, I was quite pleased with the physical quality of what I held in my hand, and the first book published by the newly established imprint Unz Review Press seems of fully professional quality. Congratulations on what you have produced. You must be happy and proud to see all your published words in one place. Is the Unz Review Press open to publish other authors? I would like to thank you for The Unz Review. The authors, variety of subjects, and freedom to comment are extraordinary. Review articles are being republished all over the Internet. Kudos. Congrats on the publication of your book, I will definitely order a copy. I hope to see more work out of the URP in the future. Just FYI, on the Amazon page, the quotes from Mearsheimer and Wade are duplicated. You’re are evidently neither an employer nor an economist! 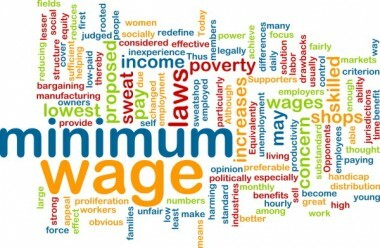 The minimum wage sets the minimum value that a pair of hands must have if it is to find employment. Lower the minimum wage to essentially nothing and all those whose labor is worth between nothing and the mininum wage will become employable. Robots may affect the value of human labor, but for now, most work still requires a human, if only as a robot attendant. There is, for example, no robot that will sew a shirt, and there are no robots serving coffee anywhere in my town. And the requirement to pay an extra dollar, or two, or five, or ten per hour because of a minimum wage law radically affects profitability of businesses that employ low-labor-market-value workers, and hence the number of such workers that they employ. I operate in a ghetto and I’ve hired plenty of people who left me poorer than when they started. Has the mathematical concept of zero and the concept of negative numbers not penetrated economics? To take an extreme example, what is the value of a work place shooter? A guy down the road had an employee burn his business down. What should one pay that guy? Lower the minimum wage to essentially nothing and all those whose labor is worth between nothing and the minimum wage will become employable. True, for a segment of the employable cohort; but some of that cohort won’t be employed at zero wage. You will have to pay someone to hire them, and then their job will be to stay far away from the workplace. Immigration and mechanization have chased a lot of marginal labor out of the market. What is our labor participation rate? Sixty percent? That is just going to go lower with robots and the fertile womb in the Third World shipping their people to the jobs. I suggest that one should position themselves to be the owner of robots and property in the future. Will capital even need to trade with labor? True, for a segment of the employable cohort; but some of that cohort won’t be employed at zero wage. Well, yes. So there remains a residual problem. But if it is suggested that the majority of the unemployed are essentially worthless, that is clearly false. For example, a generation ago, most shoes and shirts and other items of clothing worn in N. America were made in N. America. But with a North American minimum wages of $5 –10, and a Bangladesh minimum wage of $75 per month, most of the garment industry has now gone East. Such off-shoring did not turn American garment industry workers into psychopathic pyromaniacs, it just made them unemployed. Eliminate the minimum wage and supplement market wages to ensure every worker receives a living wage, and you restore tens of millions now on welfare to full employment in making shoes and shirts, car parts and computers. You will also restore to those people, both self-respect and a path to self-advancement through on the job training. At the cost points of your illustration, we shouldn’t be subsidizing industrial jobs with their attendant physical plant. It is cheaper to subsidize leisure or make work with clerical jobs, which is pretty much what we do now. The Bengals are subsidizing us; willing to live poor with no enviro or safety regulations to make our clothes. We should do something else with that money. Machines and robots are becoming those distant workers, willing to do for pennies what would otherwise cost us dollars. This is supposed to free us to pursue more expensive cultural attainments, but something seems to be getting lost: some sense of purpose and accomplishment that is difficult to replace. Also hanging out there is the potential for sentiently autonomous AI. In the battle for scarce resources, who is going to bet against them? we shouldn’t be subsidizing industrial jobs with their attendant physical plant. It is cheaper to subsidize leisure or make work with clerical jobs, which is pretty much what we do now. Rather than supplement the incomes of the working poor, you would deny them the possibility of working at all by imposing, by law, a minimum wage that exceeds the value of their labor. What you advocate is the destruction of a free labor market. You would deny unskilled workers the opportunity to take low-wage jobs in which they can acquire skills and discipline that increase the value of their labor. It is cheaper to subsidize leisure or make work with clerical jobs, which is pretty much what we do now. When you speak of “subsidized leisure” I take it you mean living on welfare. But welfare is not a healthy mode of existence for most people. It entails loss of self esteem and elevated risks of criminality and mental illness. It also means the lack of opportunity for on the job training leading to improved workplace skills and hence higher earning potential. In any case, how can it be cheaper to support someone 100% on welfare, rather than to supplement their earned income? And why do you suppose that my proposal for wage supplementation concerns only those engaged in manufacturing. Obviously, it applies equally to those in clerical, service, artistic and any other kinds of work. Anyway, why is it cheaper to subsidize clerical work than manufacturing work. There seems no basis for such an assumption. Subsidized clerical jobs in the public sector are not cheap. They generally waste a lot of people a lot of time. Better to abolish such jobs and get people into work that generates real value. But maintaining manufacturing jobs in the West is beneficial for many reasons. You don’t want to embark on WWIII without the capacity to manufacture ball bearings, for example. And America is hardly likely to emerge as a leader in industrial AI and robotics without a broad industrial base. the hardcover copy of the book by Ron Unz. It is a pleasure to read hardcover book. It contains the Index. I leave the part of Unz’s writings in History to the last, to prolong the pleasure. Thank you, Mr. Unz !